I finally found a desk for our den. The Nest ladies on the Decorating & Renovating board turned me on to this fabulous JCPenney - Pottery Barn knock off desk. 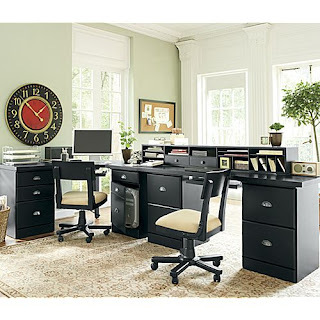 I just love it, you can mix and match to build the desk that works for you. We chose the corner piece along with a few end pieces. I want to be able to "Nest" from our Den while looking out our front window. I am hoping to paint the den "Artichoke" from Sherwin Williams one day so the black furniture will look fantastic against the green paint. The sage green couches in our great room are actually one of the only newer pieces of furniture we have in this houses so far. I still wanted to give the couch a modern make-over in honor of our new home. 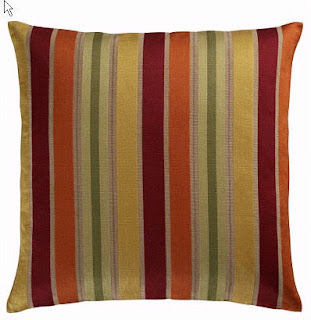 I bought 4 striped throw pillows from Crate and Barrel and hope to pick out a few window treatments that match the red stripe.